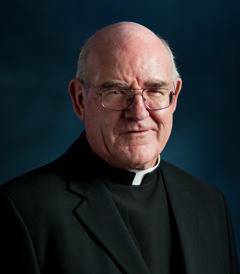 Our Pastor, Monsignor Gerard Finegan - Father Finegan was born in Cavan, Ireland. He attended St. Patr ick College, Maynooth, Ireland and was ordained at the cathedral in Cavan, Ireland in 1967 for the Diocese of St. Augustine, Florida. Before becoming Pastor of St. Mary, Star of the Sea in 2008, Fr. Gerry taught at Clearwater Catholic High School, was Chaplain at Cardinal Mooney High School in Sarasota, and was Pastor at Incarnation Parish in Sarasota from 1976 to 2008. He has also served on the Diocesan Presbyteral Council and was Vicar for Priests for the Diocese of Venice. Fr. Gerry has five sisters and many nieces and nephews living in Ireland whom he tries to visit at least once a year. As announced from the Office of the Bishop on June 11, 2010, Our Holy Father, Pope Benedict XVI, bestowed Papal Honors on Father Finegan, along with four other local priests, in recognition of their dedication and exemplary service to the Church. This Papal Honor elevates Fr. Gerry to the rank of Monsignor, as Chaplain to His Holiness. It is the first time in the 25 year history of the Diocese of Venice that priests have received such Pontifical Honors. A Ceremony of Investiture took place at St. Mary, Star of the Sea, Church on Sunday September 12, 2010 with Bishop Frank Dewane of the Diocese of Venice in Florida presiding. A wonderful reception and celebration followed in the church hall. Pastor Emeritus, Rev. Edward Pick - Moving from Cincinnati at age three, Fr. Edward Pick returned to Ohio to attend St. Gregory Seminary and Mount S t. Mary of the West Seminary in preparation for his ordination in 1960. Formerly at Our Lady of Mercy Parish in Boca Grande, in 1973 Fr. Pick was assigned to Longboat Key to build a Catholic Church and through his efforts as well as those of many devoted parishioners over the years, today we have our beautiful church. Fr. Pick was named a Knight of the Holy Sepulcher and was a former Dean of the Northern Deanery of the Diocese of Venice. Fr. Pick retired as pastor in 2008 but is very quite active at St. Mary Star of the Sea saying masses each week.